Like us, you probably celebrated too soon about Bing’s ability to target mobile separately from desktop. Bing has recently announced they are sacrificing greater control across devices in favor of “complete compatibility” with Google AdWords. It appears Bing felt managing pay-per-click campaigns across different platforms was too difficult for their advertisers. We’ve decided to change how Bing Ads handles device targeting. These changes will make it easier and more efficient for customers to manage their campaigns…. With this update, we’ll have complete compatibility with how ad campaigns are managed within Bing Ads and Google AdWords, simplifying campaign management between platforms. Advertisers know that campaign conversions vary depending upon the device. If you are advertising an app for tablets, that would obviously convert better when targeted at tablet users. Mobile apps will convert highest on mobile devices. This is why advertisers want to retain control over bid prices by device. Some search marketers were hoping that Google would add bid modifiers – copying Bing – rather than the other way around. Others were using Bing specifically because they provided capability that Google AdWords did not. In the quotes below, advertisers indicate that tablets convert worse than 20% less. “I had the privilege of being on an “advanced notice” call about the changes that took place prior to the announcement. Several other industry leaders were also on the call. The feedback on the call was universally negative. Several people brought up concerns about the model, especially the fact that the tablet modifier starts at -20%. Why not -100% or at least -50%? 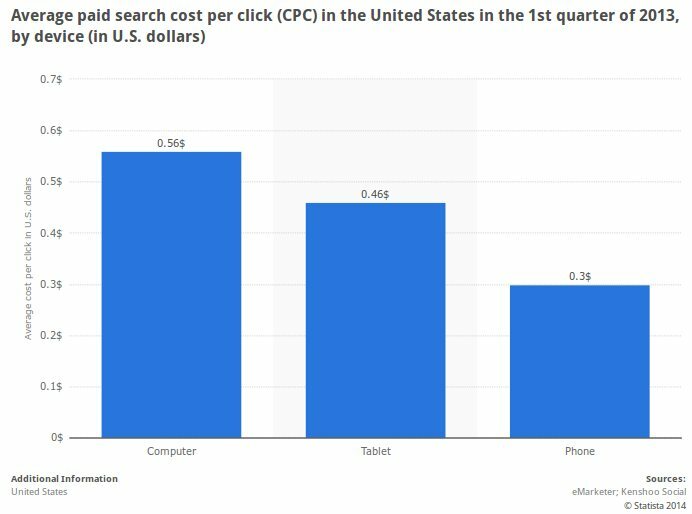 “Unfortunately, an average is just that and we find that over 60% of advertisers see tablet revenue per click running at less than 80% of desktop levels. What are these advertisers supposed to do? This is like if Nike found out the average man’s shoe size was a 10.5, so limited their shoe production to sizes 10-20. Got small feet? Don’t worry, you’ll love all the extra room in your shoes. If Bing were just to expand their modifier range to include pullbacks up to -50%, very few advertisers would be forced into inefficient spending on tablets. “This is our biggest gripe with the Adwords platform. We read our Adwords reps the riot act weekly regarding this. Tablets DO NOT convert, act the same way desktops/laptops do. They are a different device with a very different interface. 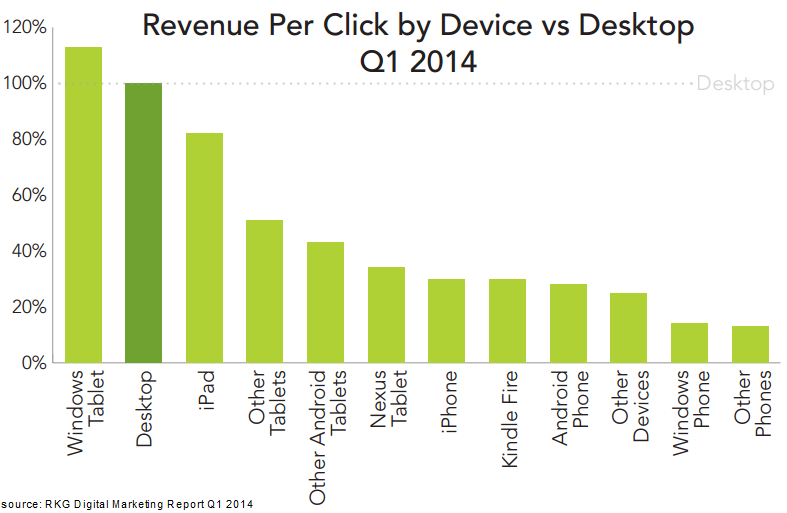 The ROI for Tablets looks very different than Desktop for us. (sometimes better, sometimes worse) When the bids are bundled this way, us advertisers lose the ability to properly bid the different device types to achieve appropriate profit targets. For folks who run separate websites for users of desktop computers and separate sites for users of tablets, this proposed change will be a disaster. Please make this an OPTION, not a compulsory merge. It is increasingly important to provide content – and to dedicate entire websites – to users of different types of devices. Starting September 2014, you will no longer be able to target Tablet-only devices on Bing Ads. Your campaigns will run across all devices. You can not opt out of showing ads on tablets, but you can reduce the bids by using bid modifiers. Bing claims their research indicates searches on tablets are similar to those on PCs, they will permit a bid modifier of only up to -20% on tablets. If your business is tablet specific, you may wish to take advantage by setting your bid modifier up to +300%. This will increase the bids you are willing to pay to target tablet devices. Starting in early 2015, you will no longer be able to target Mobile-only devices on Bing Ads. Like tablets, you will be able to reduce bids using bid modifiers. Unlike tablets, you will be able to opt out of mobile ads. “Bid modifiers act as a percentage of bid amount at the device, location, and ad scheduling levels. For example, say your maximum keyword bid is $1 and the ads are set to only show on computers. If you want to pay, at most, $0.50 for your ads to show on mobile devices, then you would set a bid modifier of -50%. Review Bing’s Device Targeting FAQs. Make sure your site works well on tablets. Implement these 3 Successful Pay Per Click Strategies. Start moving your dedicated mobile campaigns to unified campaigns using bid modifiers. Use bid modifiers to change the allocation of ads being shown on mobile-only or tablet devices. Modify any API to include DeviceOSTargetBid to specify tablet and desktop together. Drive more sales and leads by adding Click to Call Campaigns. Consider an App experience for your Mobile users. Learn to use current results to modify bids by location or timeframe. Use Retargeting so you can salvage the “click” and get the visitor back. Get ready for mobile attribution to add accountability and cost savings to your mobile campaigns. Expand into more of the Top 25 mobile ad selling ecosystems. Get started now to ensure your ads will still run after this change takes place. Add some of the suggestions above to increase your ROI and grow your business faster.